These grey socks are THE most comfortable socks EVER! As usual, I improvised a for me new stitch and this time it turned out great, or what do you think? 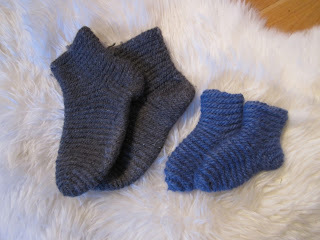 The small blue socks are made with the same stitch, but well... they are tiny, made for a baby. Kinda cute, right? I find the back prettier than the front side, so I usually turn over the end result. And I should perhaps mention that I generally needle-bind without using my thumb... I find it much more practical! One can do the same stitches either way, though.